Looking to schedule a private class or get in touch about another type of session? Curious about my background credentials? Just scroll baby! Thank you for reaching out! Typically I reply to requests within 24-48 hours. I respect your privacy! You will receive a confirmation email from MailChimp confirming you want to receive monthly (every 4-6 weeks or so) info on yoga, workshops and more. If you wish to be included - simply confirm. If not - just check back here / on the blog for updates at your leisure. By far, one of the most challenging and comprehensive trainings I have ever taken - this 70 hour, 7 day immersion delivered a sophisticated lens on human movement, structure, ball rolling and what it takes to truly identify where the body is confused or misaligned and offer a pathway to reorganize the body towards improved performance, pain reduction and general well being. I am honored to add this logo to my certifications list and incorporate YTU methodology into much of my teaching and private strategies. 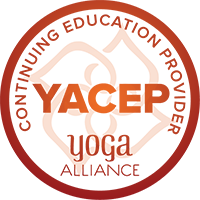 This Yoga Alliance designation of YACEP means that instructors who and those who are trying to meet continuing education requirements can build towards those when taking drop in sessions and workshops with me! Basically, It means I've taught for a long time and taken a lot of trainings and can support teachers who want to learn at a higher level! This designation confirms over 500 hours of Yoga Alliance approved training hours, 12 year history of teaching and well beyond 2,000 hours of teaching drop in sessions, workshops, teacher trainings and private sessions. This also means I can support teacher trainings as a lead instructor.